You've just entered a field with Wednesday Adams riding on a Unicorn, with stars and candy floss clustered around the scene. That's what I think whilst viewing Yohji Yamamoto and Giles Deacon SS11. I was completely dazed out of my mind. Both collections so vibrant; yet so different. 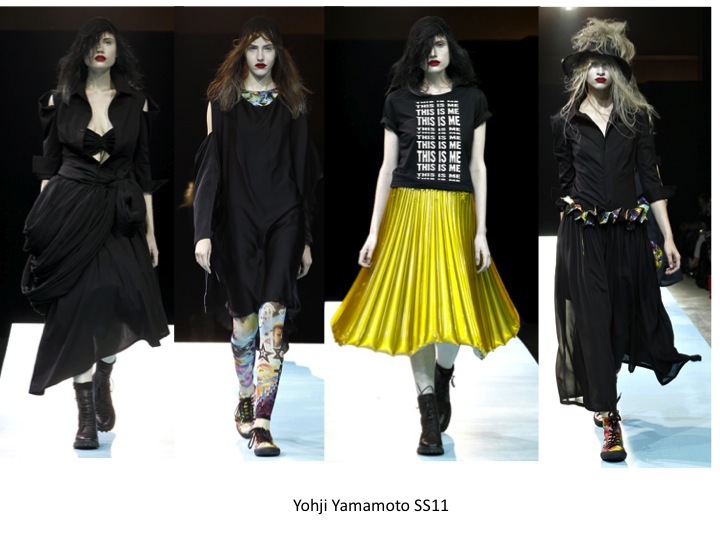 Yohji Yamamoto takes on the twist of Industrial Gothic Wonderland. Contrasting textures and sudden outbursts of colours and stylised phycadelic iconography, topped with an intricate use of layering and shapes. Giving the feel of a raw Geisha. Where as Giles Deacon enters the Sorbet neon coloured cross Industrial World, influenced by the 90's. The collections gives the feel of the whole-trashy-burn-out-celebrity feel, complimented with almost drag styled make-up. Yet all the cross themes work with trainers, structured bodices, floaty silk skirts to 50's cat eye glasses, the contrasts building up to show off the style of 90's at its best, with an edge of course. I think I'll be needing a pair of neon trainers, I'm thinking chunky and metallic. Plus don't forget to check out pieces form my collection that you can purchase now. Hopefully this post has warmed you towards the pieces with the use of contrasting textures, and gothic wonderland essences (which can also be seen in Alexander Wang SS11). You can see how to purchase here. love the bag, and mesh dress! and awww too bad the docs weren't in the pic, love them. Izzy you seriously have SUCH amazing taste. The outfits you put together and pull off are just incredible, your style really has developed! Love the Giles collection esp, not too keen on the yellow trainers tho! Your outfit is not bland!! It's awesome!! I love your striped headband/ribbon thing!! 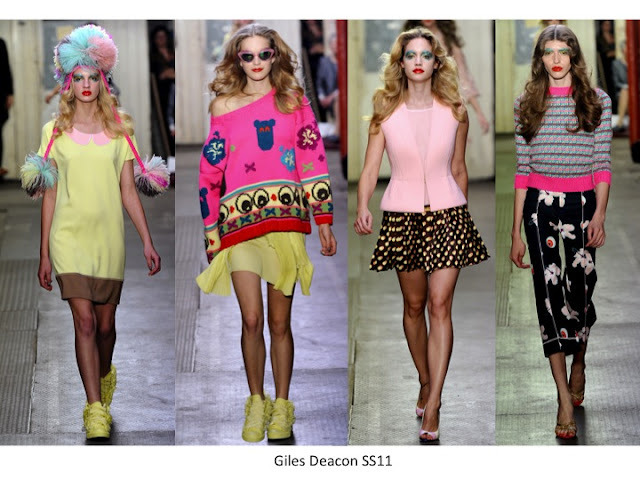 oh so cool i love giles deacon so and his collections will be every season cooler! and i love your outfit!especial the skirt. so beautiful! wow i really like this much better than the plaid skirts and creepers, and also adore those crazy white feather eyelashes keep it up!!! between the two,I'd always go for Deacon and about your outfit ? I adore the clock necklace ! I have a ring clock to go with your necklace !! I love that dress, It looks lovely on you! Yohji Yamamoto - genius! I love your bag, the detail is so pretty! great outfit, that mesh dress is so gorgeous! thanks for the comment on my blog btw, following you back! Love the mesh dress from Urban I have been looking for one of these for ages! You look Gorge! you look gorgeous and i think i actually have that belt too!I have some clunky,metalic 90's trainers..